Duratherm III, 2" x 4" Direct thermal paper label. Not perforated. 1454 labels/roll, 8 roll case. Thermal Labels, 4" x 6" Direct thermal paper label. 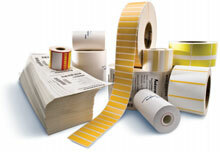 123 labels/roll, 50 roll case Also available as a roll (Part# 740854-910-R). Duratherm III, 3" x 1" Direct thermal paper label. 2702 labels /roll. single roll. Thermal Labels, Meditech Label 4" x 1.25" Direct thermal label. 4"800 labels/roll, single roll. Admissions/Chart, 3" x 1" Direct thermal paper label. 1375 labels/roll, single roll. Thermal Labels, 4" x 6" Direct thermal paper label. 450 labels/roll, 9 roll case. Duratherm III, 2" x 4" Direct thermal paper label. 126 labels/roll, 32 roll case.